After 300 km of the special, Sébastien Loeb still leads and is on course for victory. The Peugeot driver is comfortably holding off the solidly performing Bernhard Ten Brinke, 1’15’’ behind, whilst Nani Roma has climbed into the top 3 at the best possible moment. The same cannot be said for Nasser Al-Attiyah and Stéphane Peterhansel, respectively 7 and 15 minutes behind the stage leader. It is a day for rookies in the SxS category. 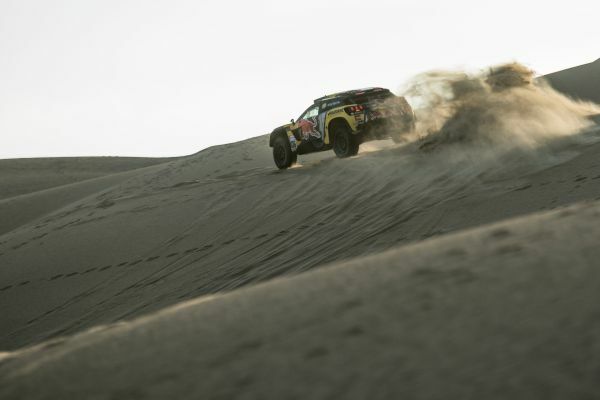 Battling with Michelangelo Bertolla since the beginning of the special, Ricardo Porem – another newcomer to the Dakar – has now taken command of the stage, but merely by 7 seconds. Chaleco López lies in wait just 13 seconds behind. Robby Gordon is returning to the Dakar following a 2-year absence and is driving a UTV Textron on this edition that is not allowing him to do battle with the best. The American lies in 21st position after 200 km of the special, a quarter of an hour behind Loeb.